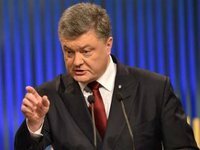 President of Ukraine Petro Poroshenko has said that "neither surnames, nor posts" will save anyone and the guilty will be brought to justice if the facts of guilt are proved. The president commented on the latest developments concerning Ukroboronprom during a regional trip, the presidential press service reported. "The army is the greatest value of Ukraine. The army was created by the efforts of millions of Ukrainians who were giving away the last things they have. The army is the pride of Ukraine. As Supreme Commander-in-Chief, I will defend the army," he said. "If the facts are confirmed, neither surnames, nor posts will save anyone. I have signed the decree on suspension and initiation of proceedings," Poroshenko emphasized. According to him, the investigation into this information is conducted by the Prosecutor General's Office, NABU (National Anti-corruption Bureau of Ukraine) and SAPO (Special Anti-corruption Prosecutor's Office). "Now, according to the results of the program, another criminal case has been initiated. I emphasize that upon completion of the investigation, the guilty will be brought to justice, if the facts are confirmed," the president said. As earlier reported, Ihor Hladkovsky, together with two accomplices, through fictitious firms, reportedly delivered contraband Russian spare parts or parts from Ukrainian military units to Ukrainian defense enterprises at prices inflated two to four times higher than the purchase price, journalists from the Kyiv-based Bihus.info said. In a video uploaded to the Internet on February 25, investigative journalists from Nashi Groshi said during 2018 they received an anonymous letter with an electronic archive of correspondence between participants in the deals. The journalists checked the information and concluded the leaked information was genuine. The journalists said the amount of embezzled funds totals at least UAH 250 million, perhaps double that amount. The investigative journalists say that Oleh Hladkovsky, who formerly was a business partner of incumbent President Petro Poroshenko, the ex-head of Ukrspecexport and head of Ukroboronprom Palvo Bukyn, as well as directors and other officials of the state-owned defense concern were involved. The investigation says the suspect deals was organized using three main fictitious firms, and that one of them included the Kuznya on Rybalsky Shipbuilding Plant, which was then owned by Poroshenko. President Poroshenko instructed law enforcement agencies to urgently verify the information made public by the Nashi Groshi program. On February 27, the National Anti-Corruption Bureau of Ukraine (NABU) informed that the detectives of the Bureau had entered the information in the Unified Register of Pretrial Investigations and started a pretrial investigation on the grounds of misappropriation, waste of property or seizing it by abusing their official position based on the analysis of information set out in the journalistic investigation of corruption in the defense sector.